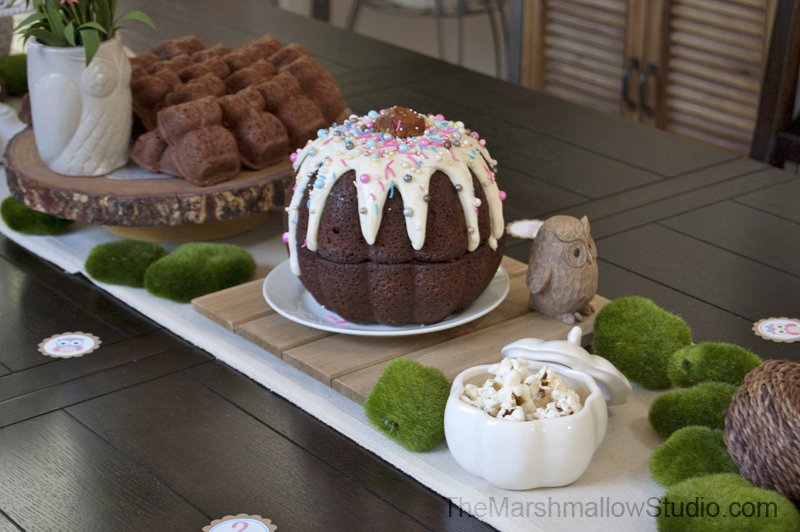 It’s been quite a long time since I styled a party for my kiddos. Between trying to sell our previous house and getting settled into our new one, we’ve kept celebrations small. With my little Kamilla’s 2nd birthday approaching fast, I wanted to do something special for her. We hardly did anything for her 1st birthday. Not going to lie here, it was a challenge getting my creative juices going. For so long my focus had been in home decorating & improvements that I hadn’t allowed myself to craft much. I started off with designing pretty printables. That always sets the mood for the rest of the party and decorations. Kamilla loves owls. She has lots of owl pajamas, shirts, toys and stuffed animals. She (kindda) picked the owl theme and I ran with it. This was the very first party where I had to limit the event to being indoors. The weather can be a little unpredictable on the island so to make sure we didn’t get rained on, we had everything setup inside the house. At first it was a little difficult imagining the party decorations being able to standout against my house decor but it actually looked great at the end. I wanted the party to be cute, girly and represent the current season without necessarily being all woodland, all Fall or all about pumpkins. 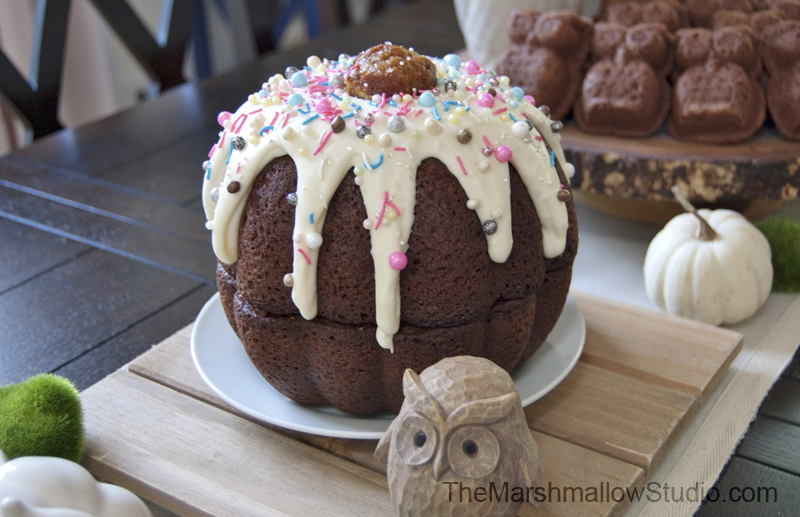 Pumpkin spice cake with a creamy vanilla glaze and lots of sprinkles. Chocolate shortbread owl cookies. These seriously melt in your mouth! So delicious. 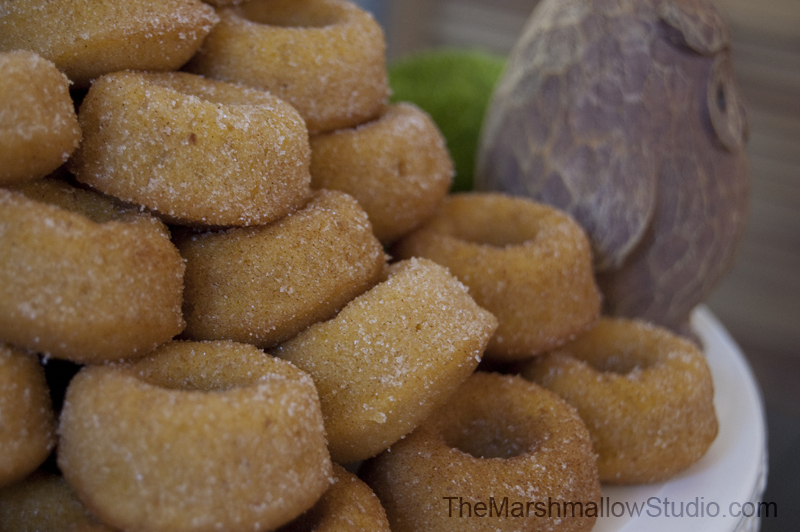 Pumpkin spice mini donuts. Can’t just have one! Adorable mini caramel apples. When I say mini, I mean super duper mini. I found them at Pike’s Place Market. White chocolate, peanut + popcorn mix with sprinkles. Her favorite were the donuts – just like her daddy. 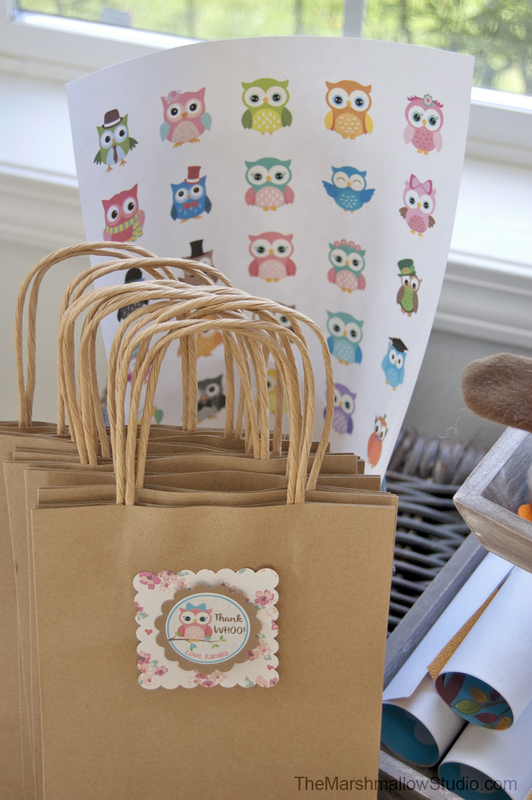 All the kiddos got to take home a goodie bag with a plush owl of their choice, a sticker scenery and a white mini pumpkin to decorate. 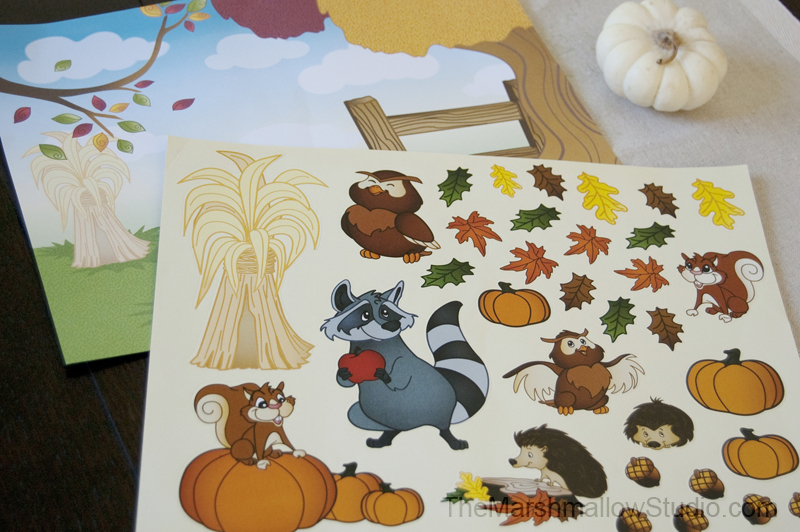 These sticker scene sheets are always a hit. I try to include them in all my parties. I like utilizing items that have a multipurpose. 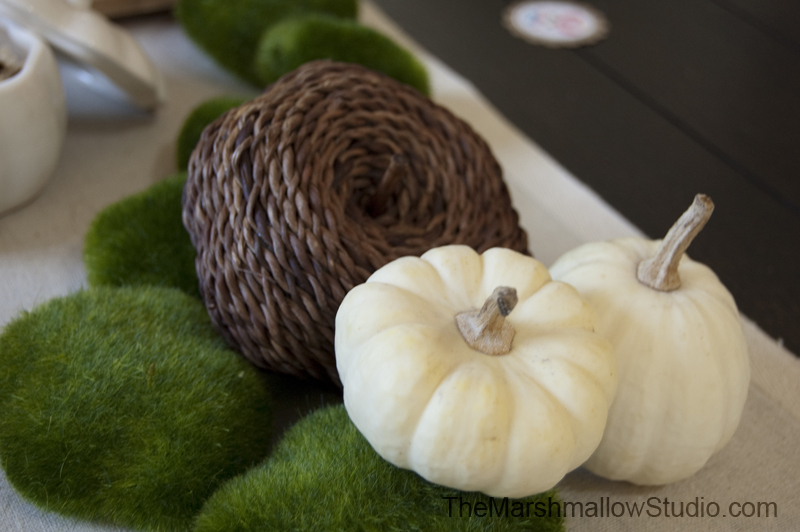 Here I used the mini white pumpkins and then gave them away as favors! I love how festive they made the house look. 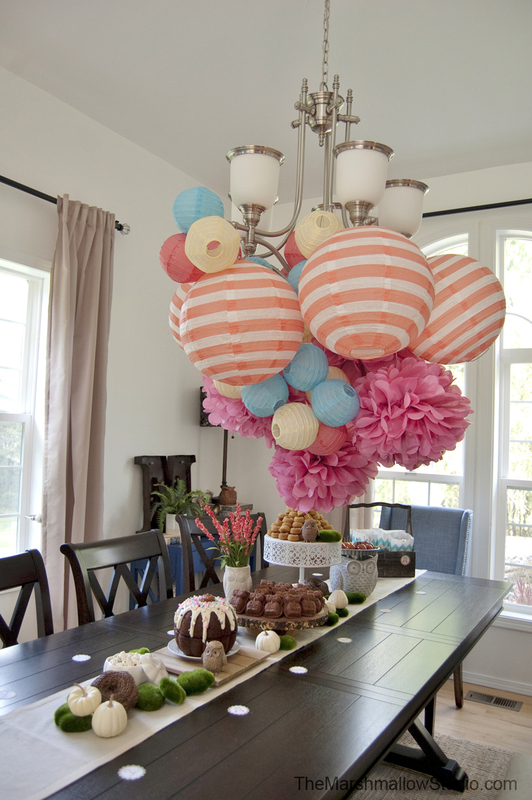 It took the focus off of the rest of the house decor and placed the guests attention on the party. In the past I have always used balloons to add “fun” to the party’s environment but I really dislike having to deal with them afterward. You know – they loose air, the kids fighting for them, having to pop them before they become a choking hazard, the list goes on. Not to mention that they can cost $1-2 each by the time you fill them up with helium and the hassle of having to pick them up right before the party. Anyway, this time I got smart! 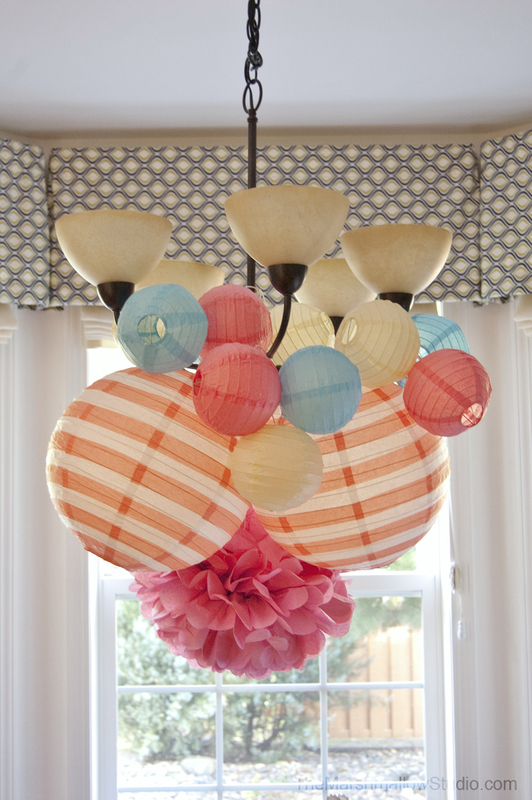 I decided to decorate with paper lanterns and tissue paper pom-poms. I ordered a variety of colors and sizes. My mom and I assembled them and then I hung them with baker’s twine. I could’ve used clear fishing string but it was easier with twine and nobody could really see the string anyway. Here’s a shot from the top. 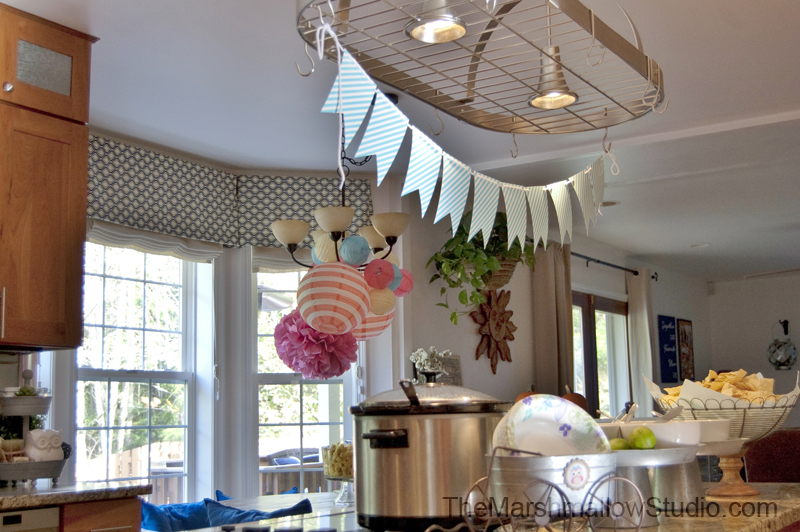 I also used them to decorate the kitchen nook’s chandelier. We set up the food on the kitchen island so I wanted to make sure this area of the house felt like a party. 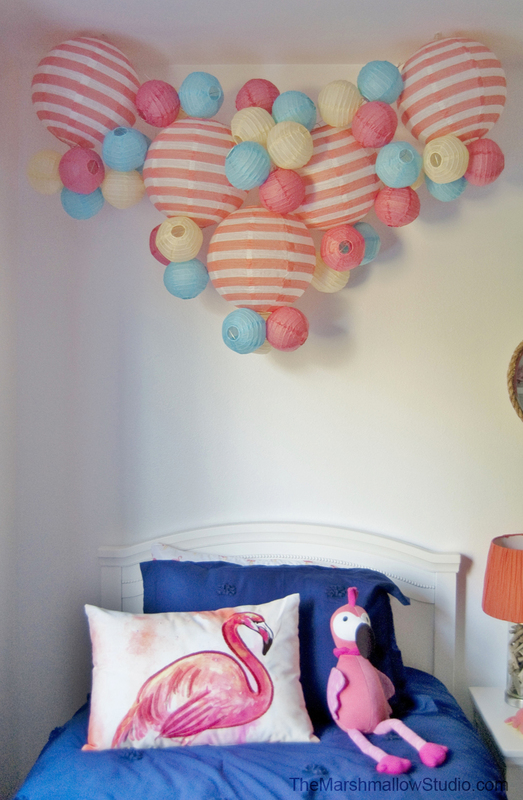 I used the same lanterns to decorate above Kamilla’s bed. They match her room decor perfectly! 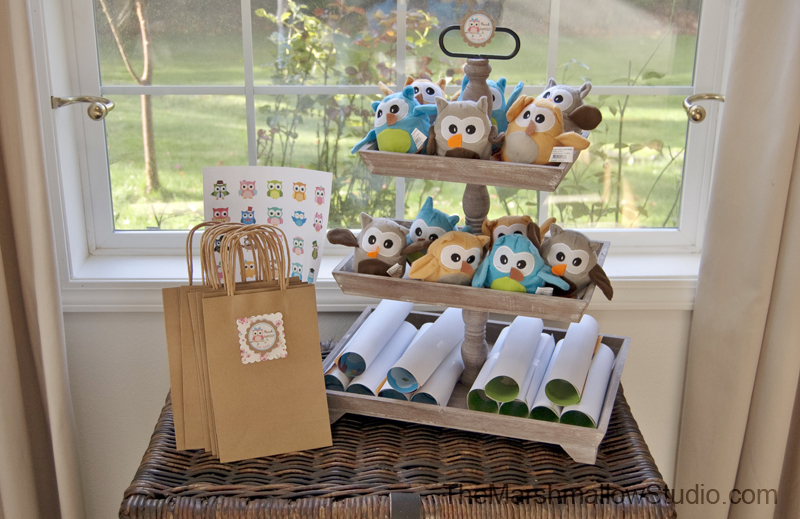 This party truly was OWL kinds of fun and we had a complete HOOT of a time! 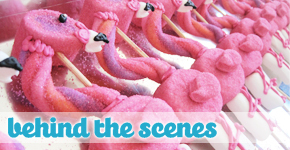 SPECIAL THANKS to Oriental Trading for partnering up with me to make this party extra adorable! 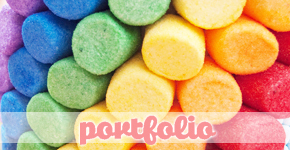 Founder of The Marshmallow Studio, Marshmallow Designer and Speaker + Author of the book mARTshmallows. She is also the Social Media + Digital Marketing Manager for Kraft Jet-Puffed Marshmallows.